A good year of renewed home sales in Killearn Estates is coming to an end. While values are still declining, the real estate graph on the right shows that more homes sold in Killearn Estates than we have seen since 2007, and the percentage of homes that sold under distressed situations declined. Currently, there are 43 homes for sale in Killearn Estates in the Tallahassee MLS, and buyers have been drawn here due to the great values available. 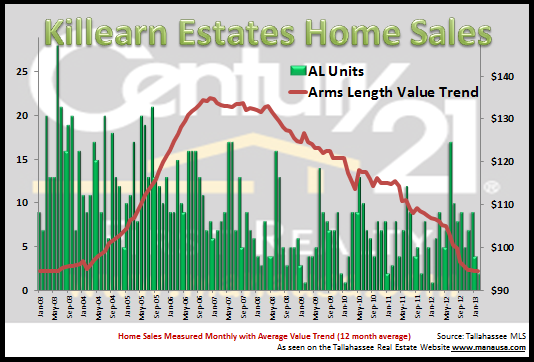 Home values in Killearn Estates depreciated another 3% in 2012, which is the slowest rate of decline since 2006. It is likely that we will see home values decline a little more in 2013, though a flattening or slight rise could occur in banks slow the rate of distressed properties for sale coming onto the market. We know there are plenty more to clear from the shadow inventory, only the pace at which they flow into the market will determine how fast the real estate recovery occurs.